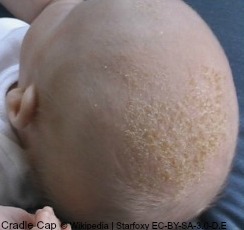 Cradle Cap is sometimes also known as Infantile Seborrheic Dermatitis. It is a condition that affects mainly the scalps of babies. It is very common, around 50% of babies get it. If your baby has it they will not suffer from any discomfort. It is rarely itchy and it isn’t contagious. It normally appears in the first few months of life. It usually goes after a few weeks, although it can last for a few months. In rare cases it can go on longer. Your child will tend to be clear by the time they reach 9 months. If you suspect an older child has the condition on the scalp, it will be classed as dandruff. A form of Seborrheic Dermatitis. It starts on the scalp. It can affect other parts of a baby's body. Primarily behind the ears and on the eyelids. It can spread to other areas of the body. Necks, the backs of the knees and fronts of the elbows. When these areas are affected it is called Infantile Seborrhoeic Dermatitis. The cause isn’t really known. it has been suggested that it is something to do with some of the glands in the skin. These particular glands, called Sebaceous glands, produce one of the body's natural oils, Sebum. The Sebaceous glands can be over-active in some babies. Over producing sebum. The extra sebum produced acts like a glue. The old skin cells stick to the scalp, causing the look of the condition. In normal skin the cells flake off. Treatment is not always required. It can clear up itself. You can improve the condition by washing the hair and scalp. Using baby shampoo can sometimes remove the scaling. It has to be done gently, so to not cause any damage to the skin. If the ears and eyelids are affected, try gently wiping. Use a damp soft cloth or a cotton bud to help remove the scales. Sometimes the patches of scaling are stubborn. They are thickened. To help free them you can massage a little oil in the scalp at bedtime. It is best to use either baby oil or olive oil. In the morning the patches that have loosened can be brushed out gently. The scalp can then be washed. If it is on the ears or eyelids Vaseline can also be used to soften the skin. It is important to try not to scratch or rub the skin. It could lead to an infection and inflammation. Your doctor may then have to prescribe an antibiotic cream. An anti-fungual cream is sometimes suggested to clear the rash, and it can also help with an infection. It is important to know that having Cradle Cap has nothing to do with bad hygiene. It doesn’t say anything about how a child is cared for. If your little one is affected by the condition they may have Seborrhoeic Dermatitis in later life. 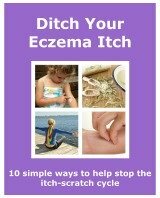 Sometimes it may turn into Atopic Eczema. Both of these conditions are very manageable.